Growing up there was a little gift shop in a shopping center we often went to. Named Whimsical Wares it was stuffed full of all sorts of tiny little collectibles and cute trinkets. I loved that shop and could spend hours browsing through everything they had. It was a favorite spot for shopping for gifts and a number one stop near the holidays. 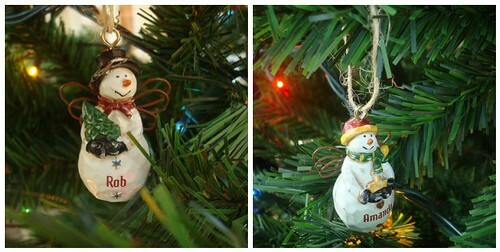 As soon as I saw these cute little ornaments, I knew where they had come from. You see, not only were there matching his/her ornaments (which my mother bravely bought us before we were even engaged) with our names, they came in an adorable miniature gift bag which matched the ornaments. (We still have that and each year, they return safely to their nest.